All transactions are safe and secure with a reliable history in online purchasing behind each of our associates. 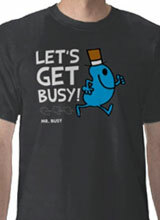 Buy the Mr. Busy t-shirt to own Mr. Men clothing and merchandise. Do you want to show everyone what a happy and busy guy you are? This Mr. Men shirt featuring Mr. Happy's friend Mr. Busy is an adorable advertisement for your easygoing busybody personality. Just like we hope that you find all the happiness that you are looking for in life, we hope you have found all that you are looking for here. Keep the series strong and yourself busy by getting the Mr. Men books or a Mr. Men plush for your enjoyment. In addition to the Mr. Busy tee above, browse the Mr. Men Clothing Gallery for more apparel like men's and women's clothes, kids shirts or hoodies.